When an opportunity to design a new planetarium arises, where does one start, and where can one end? The five finalist projects, all Quebec teams, selected by a jury of 10, ranged from dynamic to ephemeral, from constellation maps to super ecological designs to black holes, from angular structures to skin-like envelopes, each one projecting their own vision of an immersive experience that is at once educational, entertaining, cultural and emotional. With the new planetarium, being four times the size of the 1966 Montreal Planetarium, hosting not one, but two star theatres, and a multitude of new technological advancements, architects responded with resounding enthusiasm. The results were remarkable. This competition process, an anonymous two stage process, fostered ideas spanning a staggering spectrum. The ideas proposed by the 62 teams, came mostly from Quebec (48), while the rest came from Italy, Germany, France, the United States and China. However, did this competition bypass an extraordinary opportunity to renew the architectural form because of a strict emphasis on sustainability or more specifically on LEED? The winning project, whose main visible components from the street level are its telescopic canon shaped theatres, blatantly symbolizing astronomical instruments, is otherwise immersed underground – a conservative proposal at best. One thing is certain however. The new planetarium offers a green oasis within this site of concrete structures. It meets the highest standards of green building design, attaining a LEED platinum certification, an obligation, one could say, given that it seeks such proximity with nature. But what was compromised so that this high LEED standard could be upheld? As the only Francophone institution of its kind in North America, and as the first city to open a planetarium to the public in Canada, one cannot cease to wonder if the winning project fell short of such grand expectations. The existing planetarium, situated near Old Montreal was inaugurated in 1966, one year earlier than its expected opening date of 1967, to coincide with the Expo'67 world fair. The Expo'67 world's fair put Montreal on the international scene, endowing the city with a unique modern heritage, and at the time, the planetarium was a key attestation to Montreal's strong expertise in the fields of museology, science and technology – an important milestone for the City of Montreal. 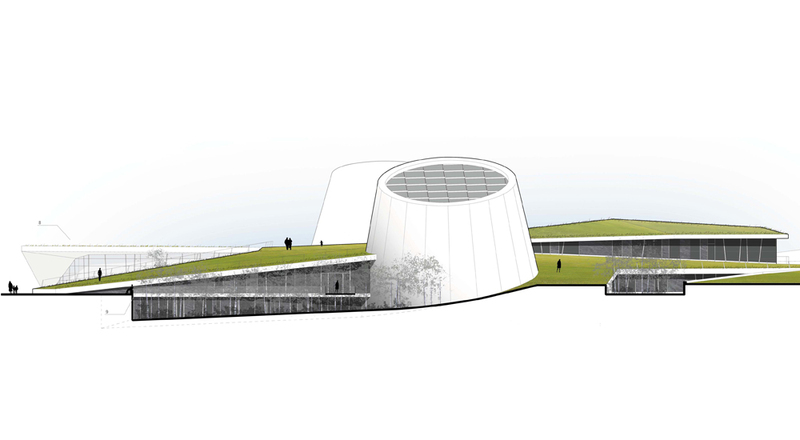 What was the driving force for the new planetarium this time around? The multitude of press releases and documents confirm that this project would become yet another example to help position Montreal as a leader in sustainable development. Is the new goal of attaining LEED accreditation on public projects the new political and cultural impetus for Montreal? There are already examples of projects adopting the LEED norm with hardly any redeeming architectural qualities. Is the prominence of LEED in architectural competitions forging a path for avoiding the very crucial architectural questions of urban form? Although LEED remains a very significant analytical tool for helping address a series of ecological concerns, its heavy focus in architectural competitions may be at the detriment of addressing other important architectural concerns and may obscure the cultural and social motivations that architectural projects as unique as this may provide. However, there is still much to delight in. The two phase anonymous competition format allowed, right from the start, an energetic display of originality by the 62 competitors - from space ship enterprises to planets in orbit to representations of toys that children play with to landscapes of Neverland – where creativity was both the point of departure inciting the desire to participate, and as seen through the ideas presented the outcome. And even if in the end, the opportunity to shine was circumvented for the more grounded and conservative goal of attaining LEED accreditation, this open competition was yet another exceptional example of potential architecture. The Canadian Competitions Catalogue therefore invites you to dream of cosmic experiences through not only the winning and finalist projects, but through the 57 other projects whose contributions were undeniable. A planetarium's form and structure may hint at the celestial experiences that lie within, and undeniably for this competition, the clichéd forms so prevalent in the earlier planetariums were dodged by many competitors.